Poverty Is Not "Natural" or "Inevitable"
Poverty is not a natural condition brought on by the poor themselves, and it is not inevitable. In fact, it can be eliminated by using the common wealth for the common good, and practicing the familial tradition of sharing and sharing alike. We have not been doing that because we've been brainwashed and duped by right-wing propaganda that claims the rich are blessed and the poor deserve to be poor -- which is part of The Big Lie. Americans should learn that poverty, hunger and homelessness have been getting worse since 1982. For example, it is no coincidence that there were only 13 Billionaires in America in 1981 before Ronald Reagan became president, but by 2004 there were 313, and by 2014 there were 460 Billionaires in America. Reaganism has been perpetuated by every president and Congress, and it has been very, very successful and beneficial to the wealthiest few. And it's been no coincidence. It's been by purposeful design and cunning strategy. It is no coincidence that while we the majority keep paying more and more for the continually escalating cost of living, the wealthiest few rake in more and more of our money. And while we've become increasingly worse off financially, they keep getting richer and richer. It is no coincident that ever since 1982 the wealthiest few have gotten increasingly and incredibly richer while the middle class has shrunk, the working poor population has grown, and more and more people are destitute. For contrary to what is claimed by those who try to justify the growing income gap, we all get poorer because the wealthiest few take so much more than they need. Consequently, around 40 percent of Americans do not have enough income to afford a decent modern lifestyle with decent housing; enough to eat; reliable transportation; adequate and affordable health insurance (even with the insufficient “Affordable Care” Act that was a boon to insurance companies); decent clothing; and many other things that would enable them to live relatively comfortable lives. About 40 percent of Americans are poor according to Western standards of living. They are poorer than their peers with equivalent jobs in Canada, Europe, and Australia. And American workers have to settle for far less benefits and less compensation for their labor. The wealthiest one percent hold the vast majority of the wealth of the nation while about 40 percent of Americans are financially insecure and at risk of poverty if not in poverty. And by any definition the political economic system in America is not fair, and we should understand why we suffer from economic crises. The current economic crises were thirty years in the making because they were brought on by the failures of an enabling, corrupt, careless, Laizes Faire government that has failed to properly regulate commerce and serves the interests of the wealthiest few and their corporations, banks and financial institutions, at the expense of the majority of the people, and at the expense of the infrastructure and the environment. Even though it actually serves "Mammon," not God or Country, the Reaganite ideology has been successful because it was sold as a "Gospel of Prosperity," which we will examine in a moment. And lest anyone think President Obama has changed that, they should learn the facts. According to a Pew Research study published in April 2013 in an article titled A Rise in Wealth for the Wealthy; Declines for the Lower 93%, An Uneven Recovery, by Richard Fry and Paul Taylor, the median net worth of the wealthiest seven percent of the population has risen by an estimated 28 percent, while the net worth of 93 percent of Americans dropped by four percent. And, because that Pew Research Center analysis was based on the most recently released Census Bureau data for 2009-2011, it does not reveal that the situation has only gotten worse since then (a fact most Americans are painfully aware of). That is because President Obama has expediently endorsed Reaganism, because the Reaganites have managed to steadily and persistently maintain and even enhance Reagan's image to the point where even many Democrats believe Ronald Reagan was good for the country and the world. The proof, however, is in the pudding, as they say. And the proof can be seen if you compare the legacy of President Franklin D. Roosevelt with the legacy of President Reagan. The ultimate results of Roosevelt made America and its middle class great, while the full results of Reaganism did the opposite. In fact, Reaganism has nearly destroyed the legacy of Roosevelt and pushed America back to conditions reminiscent of the 1920s, which caused the Great Depression. Therefore, we should examine the Reaganite rationale, because it is indeed false. Does the Christian Bible say that? Well, not really. In fact, that line in the song is based on a misinterpretation of scripture. Indeed, as was mentioned in Part One, it is a misleading concept when such an idea is taken out of context from the Bible. It actually comes from a parable Jesus told, and it's expressed in Luke 19:26 and a similar phrase in Matthew. But in the parable the one who speaks about the "haves and have nots" is actually a corrupt rich man trying to justify his greed. The problem is that hypocritical theocratic "Christians" have led people to believe that the speaker is Jesus and that he is sayin that the rich are blessed and shall have more and the poor shall have even less. But that is not true. Jesus, like Isaiah, blessed the poor and said we should care for, feed, and clothe the poor. But because the words in scripture can be misinterpreted and misunderstood, lines like Luke 19:26 can be misrepresented for bad purposes. That's just one way the Reaganite's "Gospel of Prosperity" distorts the message of Jesus to suit their own self-serving purposes. The consequence is that the Reaganites’ political and global ideology is more and more like that of preceding religious military industrial empires of Europe and America during the last sixteen centuries, as they plundered the world reaping what they did not sow, while the working poor suffered. These are true spiritual values that all fair people of conscience aspire to, including true Christians. 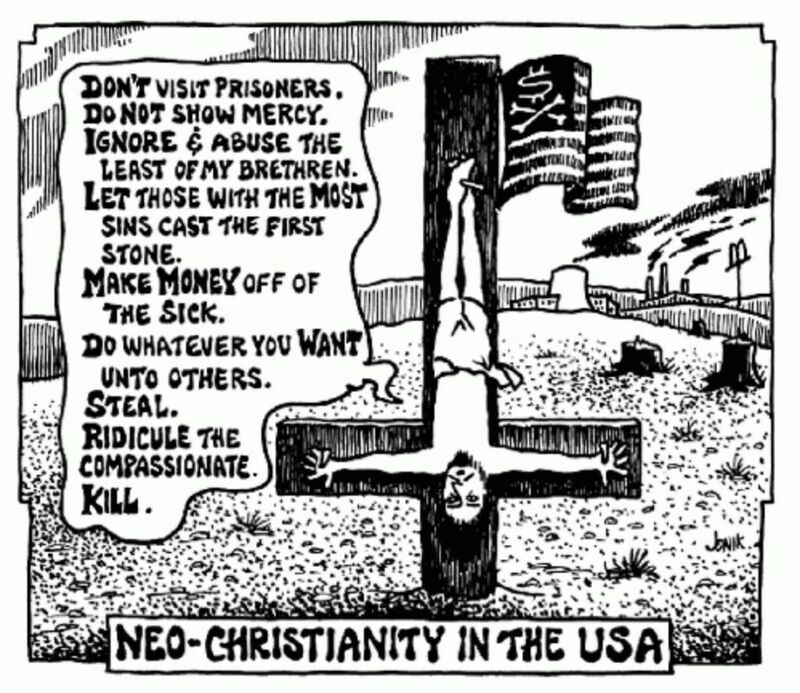 So, Americans should realize why so many right-wing Republican Neo-Conservatives aggressively and proudly claim to be the "true" Christians, while they slander and sling mud at liberals and progressives who want to invest in the people and in the country. Typically, Neo-Conservative Reaganite Republicans and Libertarians accused Barack Obama of wanting to "redistribute the wealth by taking money out of your pocket and giving it to someone else." That kind of rhetoric is misleading, blatantly dishonest and deceptive. And it's hypocritical because for the last 30 years the Reaganites and Bushites have been redistributing the wealth by taking money out of your pocket and giving it to the wealthiest few. In stark contrast, Obama and the Democrats have at least been advocating a little more fair tax and economic policies that are a little more in the interests of all the people -- even though they are now called "Republicrats" and "Corporate Democrats" for a very good reason. They have betrayed the people who voted for them. Yet, right-wing partisan politicians are even worse. They have claimed that the American political-economic system is fair, and just because the rest of us have gotten poorer it is not because the richest few have been enabled to get even richer. They claim they deserve it and we don't. None of that is true, because even though there is nothing wrong with being wealthy if you deserve it, and even though there are many people who are deserving of their wealth, too many of the wealthiest few are not really deserving, and no one deserves to be as excessively and absurdly wealthy as some of them are now. After all, who really needs to be a Billionaire? And is their incredible wealth really deserved? Did that money not come from us? And shouldn't the common wealth be used for the common good? Of course, as has been mentioned, some astute and more fair-minded Billionaires are well aware of how most people feel about them, and they have recently started to make a concerted effort to make a show of being charitable and philanthropic – which is laudable. But consider how and why they became such incredibly wealthy individuals, and consider that all their charitable contributions (whether from their individual accounts or from their foundations) are tax deductible and therefore do not reduce their net holdings. Also, how and why did they wind up with so much? Did the employees and consumers who caused their business or industry to succeed benefit in any significant, reciprocal way? Why is it that Americans have been led to believe that such individual hoarding of wealth is good, and that sharing the wealth and using the common wealth for the common good is an obsolete idea and not the ideal? Isn’t there something very wrong with this picture? It is not fair or natural that about 95 percent of the total wealth of the nation has been pilfered, hoarded and controlled by the wealthiest 20 percent, and most of that by the wealthiest one percent of the population -- while 80 percent of the people own only 5 percent of the wealth. It is especially not fair that since 1981 practically all the gains in household income have gone to only to the wealthiest 20 percent of households, while 80 percent of American households have become increasingly worse off. And Democrats have not changed that. In fact, they've wound up perpetuating the status quo. The richest 10 percent of Americans have annual incomes of $100,000 or more. The richest one percent (which is about three million people) have annual incomes of $368,000 or more. And the very richest of them have incomes that are about 800 million dollars per year. Many Chief Executive Officers (CEOs) of large American corporations have been enabled by government to rake in tens and even hundreds of millions of dollars per year. Lehman Brothers CEO $79.3 Million; Morgan Stanley CEO $18.2 Million; Goldman Sachs CEO $83.5 Million; Bear Stearns CEO $18.4 Million; Merrill Lynch CEO $80.5 Million; Washington Mutual CEO $13.3 Million; AIG CEO $15.4 Million; Fannie Mae CEO $5 Million; Freddie Mac CEO $5.3 Million. 1) Blackstone Group LP CEO $702.4 Million; 2) Oracle Corporation CEO $556.9 Million; 3) Occidental Petroleum Corporation CEO $222.6 Million; 4) Hess Petroleum Corporation CEO $159.5 Million; 5) Ultra Petroleum Corporation CEO $116.9 Million; 6) Chesapeake Energy Corporation CEO $114.3 Million; 7) XTO Energy Inc. CEO $103.5 Million; 8) EOG Petroleum Resources Inc. CEO $90.4 Million; 9) Nabors Petroleum Industries CEO $79.3 Million; 10) Abercrombie & Fitch CEO $71.7 Million. And that’s just the top ten CEOs. And nothing has changed that inequitable situation. In fact, they are now richer than ever, in spite of the havoc they have wreaked upon America. Furthermore, just as the corporate corruption and the forces of greed and self-interest brought about the economic crisis of 1929 and the Great Depression, the current economic crisis is due to their self-indulgence, greed and corruption during the last three decades. The problem is that politicians and lawmakers ignored the important lessons that President Franklin D. Roosevelt’s New Deal showed America. For example, Roosevelt proved that fairly regulating business and the economy, establishing reasonable controls on wages and prices, and creating conditions to strengthen and expand the middle class, was what once made America great. But Reaganites ignore that fact. Reagan and subsequent Reaganites took America in the opposite direction, backwards, to how it was in the 1920s, claiming "It’s just good business." And it remains that way, and has even gotten worse. You see, while there’s been a lot of complaints about the wealthiest 1 percent, the wealthiest 0.01 percent are the most filthy rich, and a good number of them are the CEOs of U.S. Military Contractors. Their fortunes boomed during the Vietnam War, and their businesses have been extremely profitable during the wars in Iraq and Afghanistan -- especially since George W. Bush privatized war to the benefit of new military contractors. The traditional military contractors have also profited. For example, the top three U.S. Military Contractor Chief Executive Officer (CEO) incomes in 2010 were: Northrop Grumman CEO - $22.84 Million; Lockheed Martin CEO - $21.89 Million; Boeing CEO - $19.4 Million. And those whopping incomes are similar to the top two financial sector CEO incomes in 2010, which were: JP Morgan Chase CEO - $20.81 Million; and Wells Fargo CEO - $18.97 Million. Military contractors are getting very rich, which is why the Pentagon is planning for permanent war. And besides all the new private contractors that the Bush administration hired for the wars in Iraq and Afghanistan, the traditional contractors that provide weapons, aircraft, ships and hardware have become richer than ever, selling about $235 Billion per year to the U.S. Military. For example, company profits are enormous. Lockheed Martin makes $35.7 Billion per year; Boeing $31.4 Billion; Northrop Grumman $28 Billion; General Dynamics $24 Billion; Raytheon, $23 Billion; L-3 Communications $13.96 Billion; United Technologies $11.4 Billion; SAIC, $8.2 Billion; OshKosh, $7 Billion; Computer Sciences, $6.9 Billion. And those are just the top ten of 47 American companies that provide the U.S. war machine, which is by far the biggest in the world. Their absurdly high profits and incomes, which were gained at our expense, not only enabled them to make their top executives very wealthy. They enabled them to wield significant corporate influence on Congress. For example, here are their lobbying (bribing) expenditures for 2010: Lockheed Martin - $12.7 Million; Northrop Grumman - $15.7 Million; Boeing - $17.89 Million; JP Morgan Chase - $7.41 Million; Wells Fargo - $5.43 Million. And that's just to bribe and influence Congress. Unfortunately, most of the corporate CEO gains came straight out of the payroll and benefits of average workers. Companies fired or laid off employees, cut salaries and benefits for the majority of employees, even as the top executives have continued to enjoy skyrocketing incomes and bonuses. Even as business has picked up since 2009, companies have been extremely slow to hire or rehire. Remaining employees are required to do much more with much less, and many of the companies that cut pay, benefits and 401(K) matches have not restored them even after raking in record profits. While the wealthiest few live so very luxuriously and even palatially, the working poor work not only full time but sometimes have to take two jobs to try to support their families. They cannot afford some of the most basic necessities of life, like sufficient food and housing, medicine, health care, utilities, or transportation. The disabled and elderly have to live on such meager fixed incomes that they are even less able to afford the most basic necessities of life. There are now almost 17 million Americans out of work and are looking for work but can’t find a job. Clearly that is not fair, and the unemployed cannot find a job even though there is much work that needs to be done -- because the federal, state and city governments claim they cannot "afford" to put people to work, when it is because they’ve cut taxes so much for corporations and the wealthiest few that governments don’t have enough revenue to do what needs to be done! After all, two-thirds of American corporations making $2.5 trillion in sales over the last several years paid no federal income taxes. For example, America's largest corporation, General Electric, as well as Exxon Mobil and Bank of America have managed to avoid paying any taxes at all. Furthermore, the average effective tax rate of the richest 400 households, most of whom are Billionaires, was only 16.6%. And by the way, in the mid 1950s the 400 richest tax payers paid about 51 percent of their income in federal taxes, but by 2007 (just before the economic crises became unavoidable, that percentage was down to about 16 percent. However, that's merely the richest 400. The wealthiest one percent of the population is about three million people, and they were paying, and still pay, as little as 7 percent (less than the working poor pay) and most don’t pay more than 17 percent of their income in taxes. Politicians and pundits who speak for the forces of greed and self-interest claim that the poor don't get poorer just because the rich get richer. But it is no coincidence. When some people take more than they need, everyone else has less than they need. While the wealthiest few are incredibly and absurdly rich and getting richer every day, the middle class shrinks and the working poor population increases. More than 23 million American children living in poverty. And, even before the current economic crisis struck, almost 30 percent of the population (91.6 million people) lived below the actual poverty line (as distinguished from the federal poverty guidelines which are grossly out of date and widely recognized as inaccurate by state government officials). That figure used to be about 20 percent of the population, which was pointed out in the early 1960s in Michael Harrington’s book, The Other America. The 20 percent figure had remained rather steady, but it spiked following the so-called "Welfare Reform" law established by the Republicans in 1996. Consequently, government statistics now do not reflect how bad the situation is, because that legislation not only made things worse but also prevented us from being able to accurately know how bad it is. And, between 2000 and 2008, the population living in poverty grew by ten percent and the plight of the poor and working poor is now even worse. Of course, statistics and numbers go up and down, and they change. But they've consistently reflected unfairness and inequity. And even though government statistics are often skewed for political reasons, they still reveal part of the reality. The reality is that the actual number of people living in poverty has increased, and the median family income has decreased by tens of thousands while the wealthiest few have gotten richer. In fact, during Bush’s reign there were further increases and even a suburbanization of poverty. In spite of the "welfare reform" legislation, we have a very good idea of how bad the situation actually is, not only from good (but largely ignored) research, but also by simply looking at how badly needed all the homeless shelters, food banks, soup lines and toy drives are; how many people don’t have health insurance or are under insured, cannot afford higher education, suffer from food insecurity, are cold and hungry, or live hand-to-mouth and are one paycheck or one catastrophic event away from financial disaster, poverty, hunger, and homelessness. We can also look at how since 2008 growing numbers of the increasing working poor population have been forced out of their houses and have to live in campers and cheap used motor homes and trailers, because even though they work full time, they cannot afford to keep a decent roof over their heads, enough food on the table, or enough heat to keep warm. If we ask all the people who help or try to help all the people who need help, we really know how bad the situation is. It is actually very easy to see what’s really going on — unless you just look the other way. Furthermore, if you also consider all the unfair price gouging by oil companies, health insurance companies, monopolistic food production companies, prescription drug companies, credit card companies, predatory loan companies and banks, and all the excess profit they are raking in from people (most of whom really cannot afford it), then you get a bigger picture of the unfairness and inequity. Over the last 30 years politicians have enabled predatory lenders and given them free license to put their own excessive profits ahead of customers’ financial security, and ahead of public good. And while Republicans blame the sub-prime mortgage crisis on "irresponsible" home buyer-borrowers for "getting in over their head," we should understand where the blame lies. The fault lies in the deregulation of the last three decades, an extreme lack of proper government regulation and oversight, and in a false attitude that called for it and permitted it. It is part of the universal divine imperative to feed and care for the poor, and it is not merely a Christian idea. In fact, it's not even necessarily a religious idea, because in the most enlightened, successful and harmonic ancient tribes and nations of the world, the elderly, the disabled, the orphans and anyone else who needed help and support received it from the community, the tribe, the village, etc. The people took care of each other, and treated each other as they themselves would want to be treated. It was the natural, humanitarian thing to do. It was just common sense. Unfortunately, the more populated and “civilized” humanity became, the less humanitarian some people became, especially those who fought for and gained great personal wealth, power, and domain in the name of religion. That is why enlightened, conscientious spiritual teachers have always been sent by God to teach people how they should behave toward one another. In fact, that is why there have been so many great spiritual teachers who have taught the Universal Divine Imperative that we should treat all others as we would want to be treated if we were them. Unfortunately, much of the political and religious leadership of the world’s most powerful empires and nations have simply ignored the Universal Divine Imperative even while masquerading as good, virtuous, and even religious. It has been that way throughout history, and it that way now -- and the fact is that the poverty rate in a nation is an indicator of the level of inequity its government allows. America's government now allows an extremely high level of inequity, which is why one of the terrible consequences of that inequity is that more than 23 million children in American live in poverty even though 97 percent of them live in households in which at least one adult works full time. That is why Americans need to learn why Thomas Jefferson, James Madison and other Founding Fathers wanted a Democratic Republic that promotes the general welfare, and why the great Jeffersonian President Franklin D. Roosevelt once saved the country from the greed and corruption of the rich and enabled the middle class to grow large and great. That is why Americans need to realize that Reaganism has destroyed Roosevelt's great legacy, and it's why Americans need to work on fulfilling the Real American Dream instead of believing in a distortion of the American Dream, about the individual “making good” and gaining great personal fame and fortune. That false dream produces a culture of greed and self-interest because it is based on the idea that people should be totally “self-reliant” and that government should do little and "get off our back" so that banks, businesses and corporations can be left to their own devices. Fortunately, growing numbers of Americans are finally realizing that we need to restore and fulfill the real American Dream, because what we suffer from are the consequences of a very clever corporate scam perpetrated by Ronald Reagan, who served the forces of greed and self-interest. Many Americans have learned or realized the shameful cause of our problems. They realize that the wool has been pulled over the eyes of many who still believe in the lies and falsehoods that were sold as truth. After all, shamelessly false right-wing Republican propaganda recently claimed that nearly half of American households receive some kind of government benefit or so-called "entitlement." However, that is extremely misleading and deceptive. According to the National Poverty Center (NPC) Policy Brief #28 of February 2012, several studies show a declining proportion of benefits go to the poor. Most entitlements go to the wealthy, and in fact, the misguided and heartless 1996 “Welfare Reform Act” ended the cash assistance program in the U.S. for poor families with children. Consequently, millions of American parents that are unemployed have virtually no cash income. They have to depend on food banks, soup lines, and the measly and hard to get food stamp allocation -- if they can qualify. Millions of children have been made into Dickensian "Oliver Twists," saying, "Please, Sir, can I have some more?" because they are hungry. The NPC expects that as a result of shrinking access to cash assistance and the increasingly poor economic climate, the number of households with children living in extreme poverty will increase as it has since 1996 and particularly since 2008. NPC estimates that about 23 percent of all households with children are living in extreme poverty. Therefore, since the majority of poverty stricken households do depend on at least one adult working full time, the fact is that the problem is not "laziness," nor do the poor deserve their lot. The basic problem is insufficient, inadequate, unfair wages allowed by a political economic system that is grossly unfair and shamefully inequitable because it enables the wealthiest people to take advantage of and exploit the disadvantaged working poor population. But, this situation was not created merely during the last 30 years, as most objective economists are saying. Since President Kennedy was assassinated and in spite of Lyndon Johnson's token "War on Poverty," the wealth of the wealthiest one percent of Americans has increased by a factor of 700 percent in terms of total national wealth. Furthermore, while CEOs of huge corporations were among that one percent who benefited, those who benefited most were the top executives in banks, lending institutions and others in the financial services industry. And the cruel irony is that when their greed, corruption and carelessness inevitably brought their industry to total failure in 2008 and 2009, taxpayers were forced to bail them out. However, in spite of the losses and suffering they have caused to other people, they did not suffer. They weren't even pressed to be more fair, and they didn't have to compensate those they essentially robbed and defrauded. In fact, they are even wealthier now than ever before. Even worse, the most needed reforms and regulations have not been put in place to prevent further malfeasance and unfairness, and very crucial regulations on banking and financial institutions that had been put in place in 1933 during President Franklin D. Roosevelt’s first term, which were repealed in 1999 by a Republican dominated Congress, have not been restored. Consequently, all the people victimized suffered and growing numbers continue to suffer, while those responsible are still enabled to indulge themselves and exploit us. The political economic system not only enables and caters to the wealthiest few at the expense of the majority and to the detriment of the working poor and the poor. It enables the greedy and corrupt to bribe legislators and, due to a right-wing Supreme Court decision ("Citizens United"), to influence elections with a flood of slanderous, deceptive attack ads on television. And most of us suffer the consequences. There are alternatives to the profit-making private banking system we have, though, like the banks and lending institutions that are publicly owned and non-profit, such as North Dakota’s (ND) state bank. It contains all the state's funds, and was originally established by the state legislature to free farmers and small businessmen from the control of profit-making bankers and railroad companies. The bank is successful and ND has been running its biggest surplus in history. In fact, North Dakota is far better in that respect than many irresponsible states that refuse to balance their budgets or bring in enough revenue. Those states are run by those who have been bribed and find it politically expedient to allow the wealthy to get away with a lot of unfairness and profiteering, and avoid paying their fair share of taxes. It boils down to the fact that the corrupt forces of greed and self-interest must not be allowed free rein, without proper regulation and government oversight, because none of the things mentioned in Part 1 about economic realities are fair or natural, and to claim otherwise is dishonest and deceptive. The problem is systemic. It is actually the result of deliberate, legislated, legalized inequity and injustice. It is cold-heartedly planned and calculated, and corrupt legislators have enabled corrupt business and corporate executives whose lobbyists have bribed the corrupt legislators. Between 1998 and 2008, the following industries spent this much on lobbying and influencing members of Congress: Pharmaceuticals $1.5 Billion; Insurance $1.1 Billion; Electric Utilities $1 Billion; Computer & Software Companies $820 Million; Business Associations $745 Million; Real Estate Brokers $696 Million; Oil & Gas Companies $687 Million. That is not "democracy at work," nor is it "petitioning the government for redress of grievances," as the lobbyists falsely claim. It’s bribery. Of course, the people responsible for the unfairness and inequity probably don’t even realize they have been corrupted, and they may actually believe they are doing the right thing for the country. But their right-wing partisan political ideology was originated to serve the interests of the wealthy few, and over time it has been carefully crafted to appear as if it's the "right" way for patriotic, religious Americans to conduct their political and private business affairs. But it's proven false and wrong time after time. Granted, those who are hard working deserve to be amply rewarded for their hard work, and those who are hard working and highly talented and skilled deserve to be richly rewarded. However, no one deserves to be as absurdly and excessively wealthy as some of the wealthiest few are now. Right-wing Republican organizations have asserted otherwise, even presenting so-called "research" designed to "prove" that poverty doesn't even exist. And they have succeeded in fooling a whole lot of people who have bought their lies and consider them as truth. That's why so many people mistakenly think poverty is either inevitable or non-existent. And, when they are faced with evidence of it, as most of us increasingly are, they just look the other way.